February 29, 2012 - HAPPY LEAP YEAR EVERYONE!! Today... is a beautiful day... because I'm doing NOTHING but working on my sewing. I know I say that most days... but I seem to get distracted and before I know it something else comes up and I'm not even touching my sewing! Man... I hate getting distracted! Don't you? Yes... I'm not walking out of my sewing studio unless it's to go to the ladies room ... or get coffee... or food! That's it! 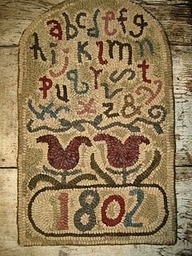 Today's blog is all about "hooking"..... RUG HOOKING !!! It's one of those crafts that I've discovered grows on you. 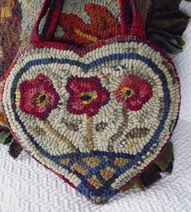 It's so odd... instead of using a paint brush on a canvas.. you are using a hook and beautiful pieces of wool to make your picture... loop by loop! 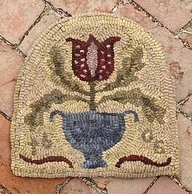 I'm getting ready to go to Texas to the Yellow Rose Rug Hooking Retreat with Katie, Susan, and Nancy! We drive... and have a blast! While there they house us, feed us (the food is SO wonderful), and we get to hook, hook, hook... plus there is WOOL EVERYWHERE! 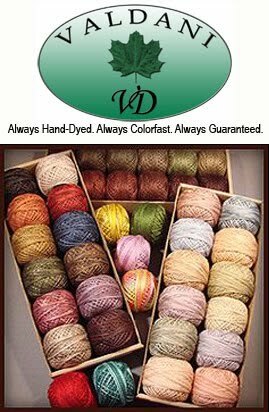 We are supposed to get a project designed (or bought) and send the information to our instructor... where they prepare our wool, hooking diagrams, etc. See... Isn't she adorable? I don't have the slightest clue where in the world they found the chicken fabric.. but it's priceless!! 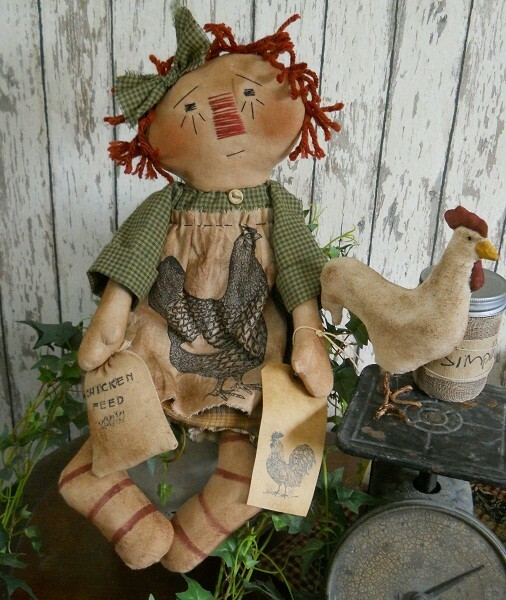 Then.. her little chicken hen friend... I'm going to hook her too... so Annie can be holding her. I have an Annie pattern (from Simplicity) that I'll use for her clothing... but I want her head, hands and feet to be hooked! My friend Katie (also my hooking instructor) is drawing her and the chicken (I just emailed her with the chicken idea) on my hooking background. I can't wait to see her!! Look at these other photos of items I would love to make!!! This sweet thing.... IT'S A PURSE! I can just see all the eyes staring at this sweet thing!!! It could be as small or large as you please... you could even put a small pocket on the inside to hold your lipstick, phone, etc. With beautiful wool... OR LEATHER straps (of which I currently own some...)... Hmmmm.... I can see this in my future. Plus..it's fast to hook!! Then we have the alphabet samplers. I just love these things... I wonder if I was a teacher in a past life? 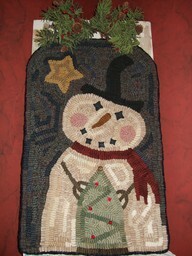 I don't care if they are in cross-stitch, rug hooking or in a quilt... I LOVE THE ALPHABET! Isn't that a bit odd? DON'T answer that question... I surely know it is !! 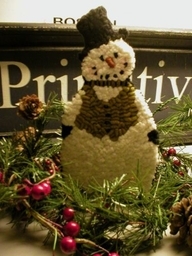 then... we have the seasonal hooking... OH MY... that's another issue all by itself! I love THEM! Look.. .here are some of my favorites!!! Hey... did you know that Hazel is my middle name. No.. .I normally don't tell people my middle name (after my Grandmother) but I'm thinking it must be why I love the fall so much! Ya think???? Look at these pumpkins... I know it may be a little hard to see ... but the front one actually has a spider hooked right into the pumpkin itself... and look at the face on the second one.. and then the third one has all colors hooked in swirls... Oh my... I sure do want to make these. KATIE... we have some more drawing to do... don't you think? Then... to make them even more awesome... they have used actual pumpkin stems in the tops of them. 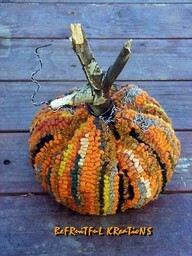 I can also see hooking some leaves and stitching them to the top... for a 3-D look. hhhmmm.... I feel additional projects coming about!! Is this not adorable???? I love his stubby little arms and that little Christmas Tree!! This guy I want to make... he would look so awesome in the middle of my dining room table in a display... especially in one of my dough bowls...full of greenery and berries!! 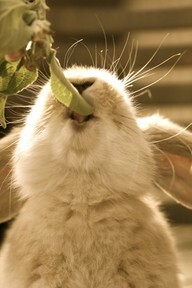 Then... this little fellow... I think I'll make him into a pillow... with a big plaid ruffle around the edge in the colors of the pillow! He will be so adorable on my couch this winter. Oh... heck... who am I kidding... these are going on my "hooking bucket list"... it's getting rather lengthy too!!! Let's all say "aaaaaaaawwwwwwwwwwwww"... together!! Ok.. I'm leaving you now and getting busy on putting the rows together on my new quilt I've designed.. .it's going on our bed. I want to take it to Lynn and Cathy tomorrow for quilting. I can't wait to see it finished... then... to write up the pattern!!! See you soon... have a SUPER... GREAT.... DAY!!! p.s. 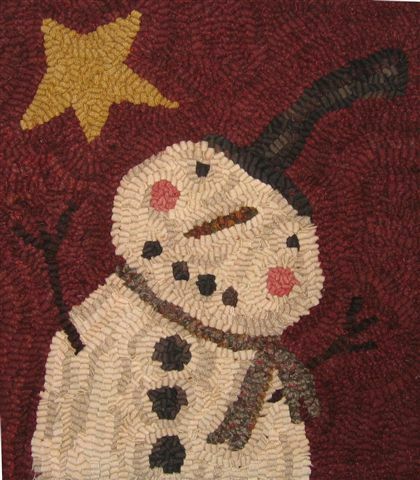 If you want to learn how to hook... make sure you email my friend - Katie - at Kiss Rug Hooking .... She has classes in her studio... plus will help you with any design you want! She's AWESOME!! !